Disclaimer: This article is about political strategy written by a Democrat for Democrats (and liberal-leaning independent voters). If you are a conservative who loathes Hillary Clinton, please consider this before leaving comments about your perceptions of her innocence, guilt, or character. That’s not the subject of this piece. Further, with Mr. Trump stating on November 22 that, with regard to investigating and prosecuting Secretary Clinton, “It’s just not something I feel very strongly about,” and “I don’t want to hurt the Clintons,” one might take false comfort in thinking my suggestion unnecessary. I would argue that in this “post-truth” environment, both arguments matter little. One must be wise enough to add the phrase, “…right now” to the end of any absolute declaration by this particular President-Elect, especially given that in the same interview he refused to take such action completely off the table. First of all, we don’t know that. Second, I don’t care – she should be asking, for reasons we will explore. And even if she doesn’t, neither did Nixon (that we know of). If you don’t think there’s still a risk to Secretary Clinton, than you haven’t been listening. 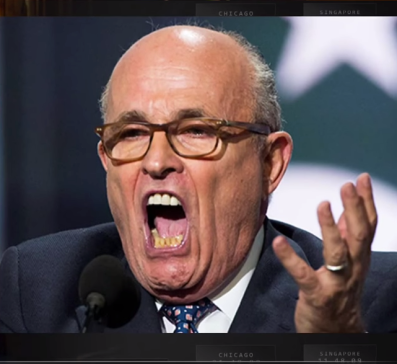 She has been repeatedly accused of crimes, multiple in number, and has endured ridiculous and humiliating bumper stickers like “Hillary for Prison,” “Hillary Lied and 4 People Died” (Benghazi) and even subjected to the official delegates to a Republican National Convention chanting, repeatedly, “Lock her up!” At one point, the bridge blocking bully himself, New Jersey Gov. Chris Christie, led this refrain during a prime-time convention speech that played out more like a Kangaroo Court. … and you’ll forgive me if I find attempts to snuff out any talk of a Pardon being necessary a bit naïve. “…Pursuant to resolutions of the House of Representatives, its Committee on the Judiciary conducted an inquiry and investigation on the impeachment of the President extending over more than eight months. The hearings of the Committee and its deliberations, which received wide national publicity over television, radio, and in printed media, resulted in votes adverse to Richard Nixon on recommended Articles of Impeachment. “Adverse to Richard Nixon” as Congress’s votes may have been, history still shows that only two presidents have been impeached: Andrew Johnson and Bill Clinton. So for what indicted crime on Nixon’s behalf was President Ford granting a Pardon? 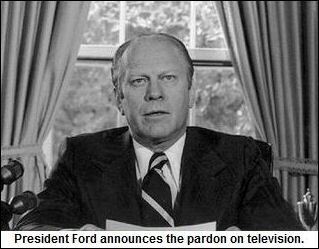 As the words, “or may have committed or taken part in” reveal, Ford was pardoning things that MAY HAVE happened. So why couldn’t President Obama do the same for Secretary Clinton? The precedent is clear. If well worded, and presented correctly, no I won’t – more on that below. Besides, the millions who think she’s guilty “of something” anyway aren’t gaining much by any perceived “acknowledgement” that a Pardon delivers. Plus, either way it isn’t as if they were magically going to vote Democratic in the next election. Let’s face it – millions of taxpayer dollars have been used by the Republicans to hold hearings intended to embarrass and raise doubt about Secretary Clinton character and competence. Even when she appeared in person and aptly defended herself as she did in 2015, is there anyone who now doubts the Republicans were effective in eroding public trust in Hillary Clinton? There is absolutely no doubt that a good segment of even non-party affiliated American voters were susceptible to the doubts raised by a Republican majority. And yes, these hearings “received wide national publicity over television, radio, and in printed media,” In today’s environment, they also were subject to added life and hyperbolic emphasis delivered through the “fake news” and memes appearing on a large swath of social media platforms. Bottom line: those who think she’s guilty of something still will, cannot be deterred or convinced otherwise, and are not likely to evolve into persuadable voters for Democrats and progressives. So why not grant the Pardon? Face two simple facts, kids. Your older parents are never going to change, and these particular Americans are never going to like us. So by God best to protect Hillary and take this off the table. Look, any grand jury and special prosecutor selected to investigate and bring charges against Secretary Clinton is certain to be so biased that they would likely make Ken Starr seem, by comparison, like that neighbor who moved away years ago but who you suddenly miss terribly at book club. Their “discretion,” I am sure you can concede, will be the most predictable portion of this entire scenario. I’m even more certain that such a trial would be such a media circus would bring the current “culture war” that exists among our divided nation to a boiling point. That’s nonsense. When has Donald Trump ever been too busy for whimsical, attention-grabbing stunts? Isn’t the sole individual deciding who and what to prosecute. Is a guy that usually decides something based on what’s said by the last person with whom he speaks. This “last person” may likely come in the form of third-class Attorney General nominee Jefferson Beauregard Sessions, III, whose name alone elicits visions of white sheets and rope. From a guy like Sessions, can you honestly see anything other than blatant attempts at voter suppression besting her prosecution as a matter of priority?! I don’t. For this to work and at least have a shot at being played down, “also ran” news, this is the only way I can see it having a chance. Fridays in politics and public relations in general are days where bad news and apologies are, as the saying goes, “put out with the trash,” not likely to be read with Saturday’s paper. On Friday, January 20th, President-Elect Trump will be sworn in at Noon Eastern. 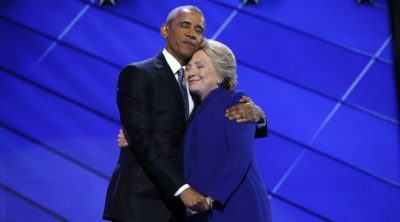 As one of his last official acts, President Obama should sign a Presidential Pardon for Hillary Clinton and let the news it makes get swarmed over without much fanfare when put side-by-side with Inaugural coverage and the early days of the Trump presidency. Failure to shield Secretary Clinton from any further reproach over her scandals – perceived or otherwise – will be more than simply a missed opportunity to weaken the Republican/Trump arsenal of political mass distractions. It would serve as nothing short of a politically tone-deaf dereliction of duty in light of the abundant warnings and threats made by Republicans and their arch-conservative interest groups to hound her for the rest of her days, and an abject failure in pushing America forward beyond the nasty aftertaste of Election 2016. Well written. The party in power, however, has never been the most inclusive and in today’s climate, prefer the divisiveness as the means of attaining and retaining power.